A Disgruntled Republican in Nashville: Policing for Profit may be coming to an end in Tennessee. 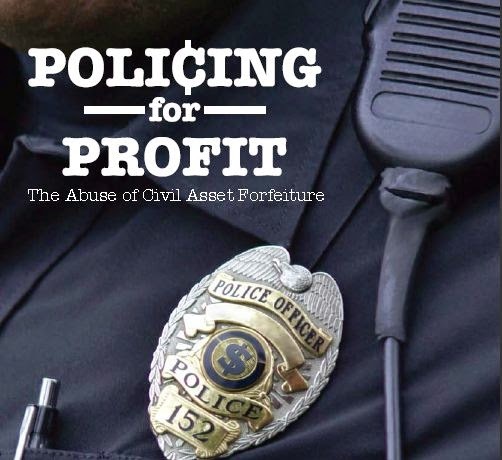 Policing for Profit may be coming to an end in Tennessee. As unbelievable as it sounds, if the police stop you and you are carrying a large amount of cash the police can confiscate your money, never arrest you or charge you with a crime and you have to go to court to get your money back. They can also confiscate some property such as your vehicle. That would appear to violate the 4th amendment to the constitution but the policy has been allowed to stand. Getting the money back can take months and can be costly. Some people never recover the confiscated cash or property. One has to prove the source of the money. Legislation was introduced by Rep. Timothy Hill, R-Blountville, that would have repealed civil forfeiture laws that make the practice of police confiscating cash and property legal. Hill has amended his bill so that instead of prohibiting all civil forfeiture, that civil forfeiture could still occur but only when there is an arrest. That is an improvement over what we currently have and would end most of the abuse. Police will argue that civil forfeiture is an important tool to curtail drug trafficking. It may be helpful in that regard but so would wiretapping without a court order or beating confessions out of people. Civil forfeiture is wrong and needs to end. This bill needs to pass. Channel 5 news has reported on "policing for profit" extensively. For more information follow this link. The reason this is allowed to happen is poor policies by law makers, pensions have to be paid to the retired cops & new cops hired, they don't have the funds, so they go after anyone they can to steal money or private property. This bill should read as it is illegal to seize anyones assets, period, Tenn., has become no different than what the USSR once was. Russia is freer than the people who live or travel in TN. I know a coin collector who went through a road block, he had cash & coins, they seized al of it saying this 80 year old man was a drug dealer. Also you need to look at the Prison Corporations, these have become Cash Cows for the Share Holds, Slave Labor is what is comes down to. Shame on these Law Makers-Breakers, they should be made to give back all of their retirement bennies & all other assets made while in office, the Corruption in this State & accross the USA is at a all time high, just like DC, the NYC Courts & NYC TBTF Bankers. Stop illegal stealing of people assets or be recalled & lose your jobs. We need to start the Recall Process now! TN does not have a Recall Statute, which is necessary short of impeachment to remove an elected official. Sorry, my fellow Tennessean, but you can't get there from here. You can campaign against them and lobby each of them by whatever legal means possible to amend the state statute. Recall the adage that , "No one is safe when the legislature is in session." I am all for removing anyone, including Lamar Alexander, Bob Corker, and Gov. Haslan for introducing, sponsoring, or supporting the Internet Out-of-State Sales Tax Bill, which is fraudulently named "Marketplace Freedom Act." Civil forfeiture is an extremely unconstitutional denial of due process and a shift of the burden of proof to the victim of government theft, from the misconducting government agency, where the Constitution properly places it.